We are inviting anyone who wants to ride with us September 20, 2014 to go. The ride is leaving the Will Rogers Centennial Trail Head at 9:00am at Oologah Lake. There are no fees or charges. 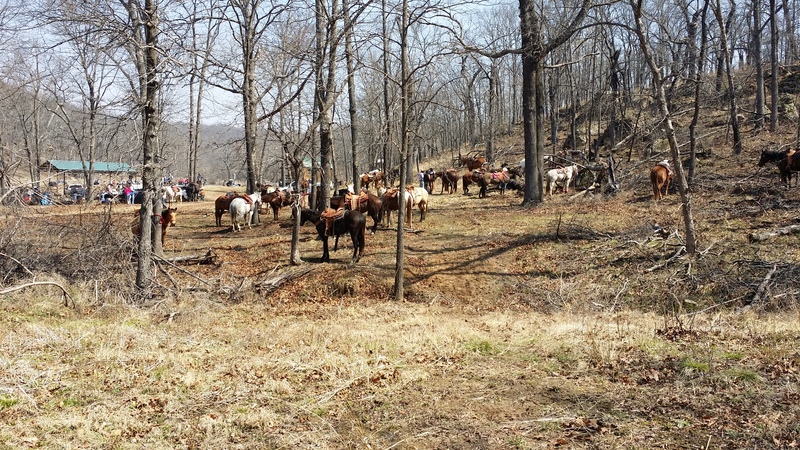 It’s not an organized trail ride, just a chance to meet some people and have a great day on the trails. Who might enjoy the ride? Anyone interested in dressage, mounted patrol, mounted search and rescue, trail riding in Oklahoma, or just wanting a fun group ride. We see the opportunity to blend and combine several riding disciplines in one get together so everyone can learn more about horses, riding, and community involvement. For example, a dressage rider can illustrate how precise movements enable trail riders to navigate obstacles on the trail. Mounted patrol members can show dressage riders how their skills might be put to use in real life rescue operations to help save a life or rescue someone in danger. New riders would be able to observe and talk with professional horsemen to gain new insights into all riding disciplines. There will likely be several riding instructors and trainers present. So pack a lunch and join us for a great day on the trail and meet some new friends. 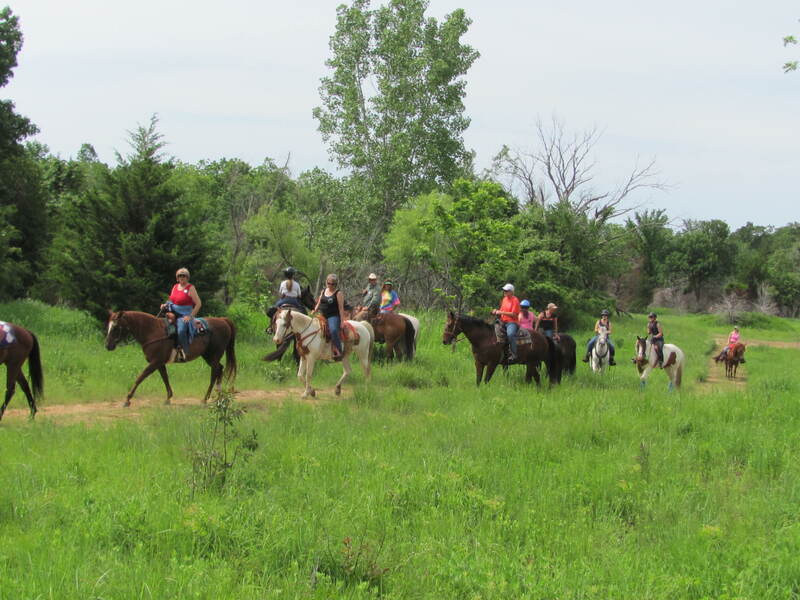 The Oklahoma Equestrian Trail Riders Association (“OETRA”) held a trail ride at Bell Cow Lake this past weekend. We were only able to attend Saturday, but met some really nice people. Funny, horse people tend to be great folks. Those attending this ride were certainly pleasant and welcoming. The members of OETRA had spent the weekend before working the trails and clearing brush. The trails were marked very thoroughly and extremely easy to follow. The weather was somewhat typical for Spring in Oklahoma. Saturday was windy and gusty, but warm. The sunshine was warm, but not hot. OETRA has been conducting a membership drive. If you are looking for trail riding buddies, you ought to make contact with the group and attend one of their trail rides. We were told there are several more rides scheduled thru the Spring and Summer. We plan to attend more of them. It’s tough to get enough trail riding in Oklahoma this time of year!!!!!!!!!!! 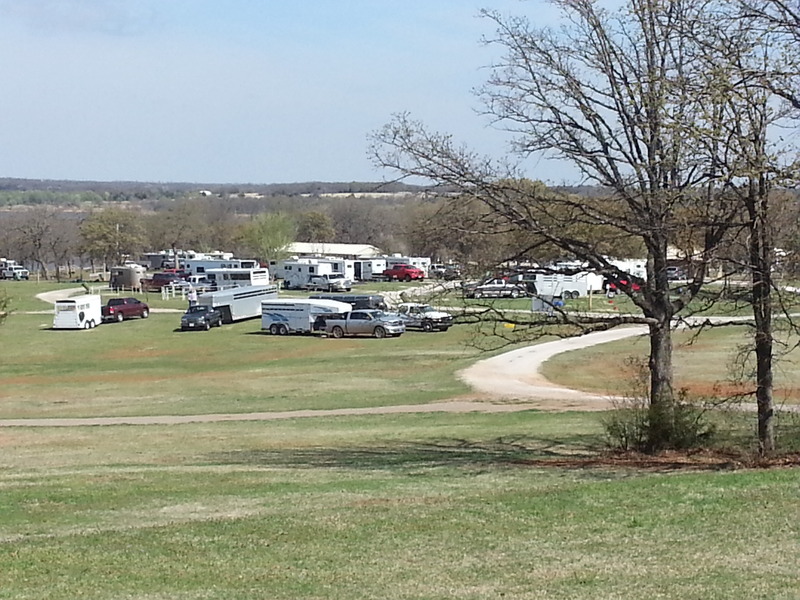 Julie Cameron reports the Oklahoma Equestrian Trail Riders Association is hosting a weekend of trail riding and camping the weekend of April 11 – 13, 2014. There will be a lot of trails to ride and entertainment in the evenings. Saturday night will have a pot luck dinner to create some new friends and get to know each other. But, the most important and best part of the weekend will be riding the trails in the Oklahoma Springtime. It will be green and alive with all the new growth that always starts this time of year. The cost of attending is very reasonable, $15.00 for non-members and $10.00 for members of OETRA. Children under age 12 may attend free of charge. Julie wants to put the word out that everyone is welcome! If you want more information, send her an e-mail lazyjfarm@sbcglobal.net. Labor Day Weekend is a great time for trail riding in Oklahoma. This year didn’t go as planned. There was a trail ride we planned to attend, but life came along. Oh well, it gave me a chance to give Chex a pop quiz. Monday morning, Chex was saddled just after dawn and we took a tour off the ranch. He did pretty well with a new rider, brush and weeds head high, and in new territory without any other horses. The brush and weeds were a good opportunity to observe him riding without much vision. You could see the ground as we rode, but not much else. A snake or two wiggled underneath his feet, but nothing more for about 20 -30 minutes. Suddenly, a big doe jumped out and Chex jumped as well. Not far, and he shut down as the reins were pulled just enough to take up the slack. He went right “back to calm,” a term we use to describe when the horse returns to a relaxed mode and rides quiet. We continued until we found a road. Some cars went past. No worries for Chex, cars weren’t a bother. Our little excursion went for three hours before we ended up back at the gate. Chex would have been okay stopping, but we still had our chores to get done. The fence has to be ridden every day. It’s a familiar 3 mile trek for Chex, but the horse flies are heavy this time of year. Some young horses get a little dancey and jittery when attacked. Not Chex, just part of the job. With several trees limbs placing pressure on the fence, it was a good time to test Chex’s willingness to ground tie. Each time the reins were dropped, he patiently waited even when limbs were tossed at his feet. If you haven’t given your horse this little quiz, you can find yourself enjoying a stroll back to the barn. Chex didn’t do that. Until recently, Chex has been ridden by only one person. Part of our training program is designed to make the horse calm and responsive. Too many riders/trainers on a young horse can really frustrate the process. No two people use exactly the same cues or use them the same way. For a young horse, this can be extremely frustrating to be trying really hard to do what is expected, but confused about what is wanted. You see the results when people take a horse to the trainer for 60 days and decide they aren’t satisfied. The horse goes to the next trainer for 30 – 60 days and spends most of it trying to figure out the new cues. The owner then gets the horse home and rides for 30 days with a new set of cues. Not happy, the owner goes to trainer #3 and starts all over again. It’s no surprise the horse doesn’t handle well and gets jumpy from all the different riders. In our program, there is only one rider until the horse has a chance to understand what is expected of him. Typically, the second year other riders spend more time in the saddle with the horse learning that people speak with different dialects (slightly different cues). A new rider is like a new teacher at the beginning of the school year. The horse isn’t completely sure about it. Taking the horse away from what is familiar is like changing schools. Chex did well with a new rider and a new school at the same time. But, his test wasn’t quite finished. An empty feed sack was grabbed from the barn and the next 20 minutes used to see if he would get excited while riding while waving the bag in his face and all around his body. It didn’t faze him. The last part of the test was dragging some brush off. We had a few small trees that died and fell over. Chex got to drag them off. He patiently did the work without complaint. It was a relaxing time with Chex and a real pleasure seeing him developing into a wonderful trail horse. 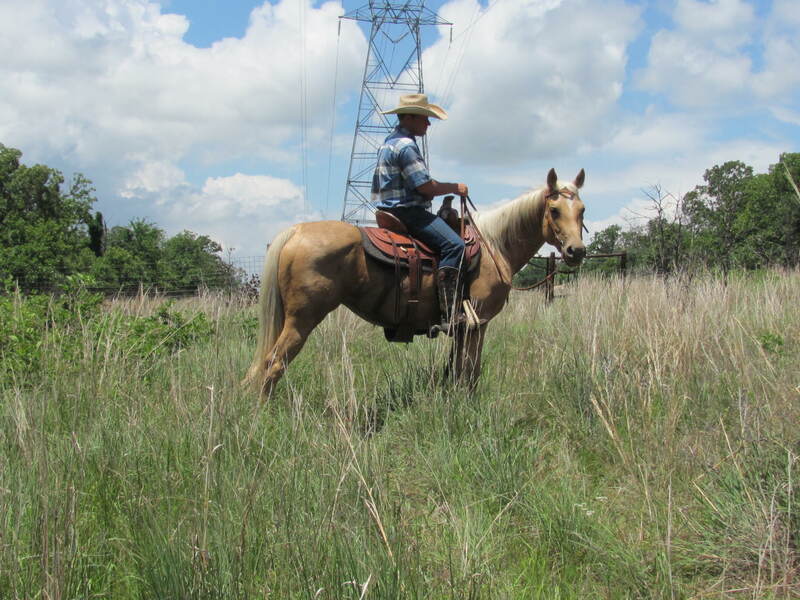 Prevent Blindness has its annual charity trail ride scheduled September 27, 28, and 29, 2013 at Dripping Springs in Okmulgee State Park. Everyone is invited and the trail ride is to help raise funds for a worthwhile organization. Okmulgee State Park is about 5 miles west of Okmulgee, Oklahoma. With all the wonderful rain in August, everything has been beautiful and green. This will be a great time to enjoy some beautiful scenery from horseback while raising funds for those who don’t have the gift of vision. For more information, you can call OKC: 405.848.7123 or Tulsa: 918.496.348. The City Slickers Trail Ride sponsored by the Bad Girls Trail Riding Club (“BGTRC“) was success. The ride was held at Walnut Creek State Park and well attended. The ladies running the trail riding club were really friendly and did a great job of conducting a safe, fun ride. The area has quick sand around Keystone lake and can be dangerous if you aren’t familiar with the area. So the ride was conducted with a guide and everyone stayed on the main trails that are safe and well-maintained. If it has been a few years since you have gone to Walnut Creek, there have been some changes that make it a lot better. A couple of the park rangers have been working really hard the last two years to clean up the trails and make the area more attractive. The bathroom and shower areas were clean and obvious effort had been made to encourage trail riders to use the facilities and enjoy the trails. Hats off to the rangers for their hard work and dedication. It was a good time and wonderful to ride with the sun shining, the breeze blowing off the lake, and enjoy the company of some fellow trail riders on a beautiful Spring day. We want to thank BGTRC for letting us come and ride the trails with them! Washington, D.C. Trail Rides, Who Would’ve Guessed? If you are politically active, you could drape a banner over the side of your horse as you ride along the trail. Okay, maybe that’s a little over the top, but the trail rides aren’t!